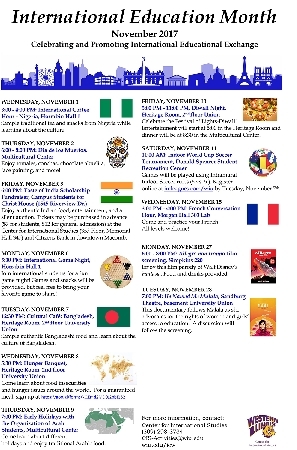 MACOMB, IL – International Education Month will be celebrated at Western Illinois University in November with a series of activities. The commemoration is an opportunity to celebrate the benefits of international and exchange worldwide. All activities are open free to the public, unless otherwise noted. • Wednesday, Nov. 1, 3-4 p.m. – International Coffee Hour – Nigeria, Horrabin Hall 1: Sample traditional tea and snacks from Nigeria while learning about the culture. • Thursday, Nov. 2, 6-8 p.m. – Dia de los Muertos, WIU Multicultural Center: cultural celebration with food and activities. • Friday, Nov. 3, 6 p.m. – Taste of India Scholarship Fundraiser – Campus Students for Christ house, 1545 Riverview Dr.: The event will include authentic Indian food, entertainment and a silent auction. Tickets in advance are $7 for students or $12 for general admission and are available at the Center for International Studies, Memorial Hall 347 or Citizens Bank in downtown Macomb. • Monday, Nov. 6, 5:30 p.m. – International Game Night, Horrabin Hall 1: Games and snacks will be provided. 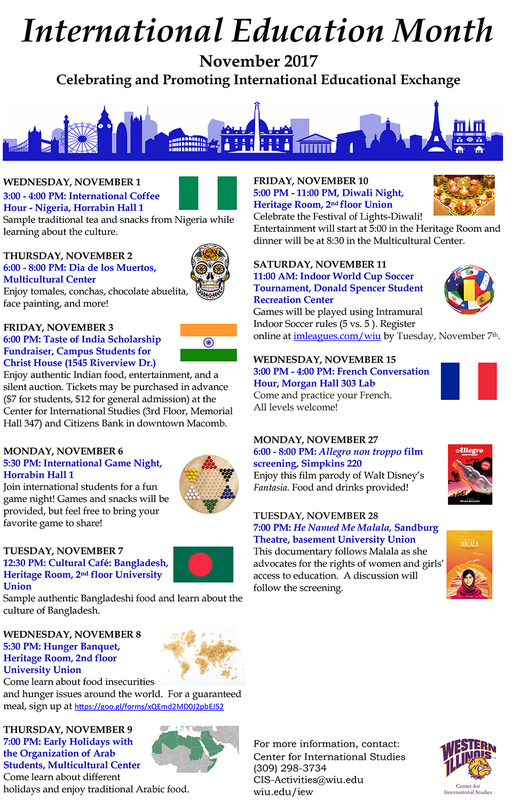 • Tuesday, Nov. 7, 12:30 p.m. – Cultural Café: Bangladesh, University Union Heritage Room: Sample authentic Bangladeshi food and learn about the country's culture. • Wednesday, Nov. 8, 5:30 p.m. – Hunger Banquet, University Union Heritage Room: Learn about food insecurities and hunger issues around the world. To register, visit goo.gl/forms/xQEmd2MD0J2pbEJ52. • Thursday, Nov. 9, 7 p.m. – Early Holidays with the Organization of Arab Students, WIU Multicultural Center: Learn about holiday celebrations and enjoy traditional Arabic food. • Friday, Nov. 10, 5-11 p.m. – Diwali Night, University Union Heritage Room, WIU Multicultural Center: Celebrate the Festival of Lights – Diwali. Entertainment begins at 5 p.m., and dinner will be served at 8:30 p.m. in the Multicultural Center. • Saturday, Nov. 11, 11 a.m. – Indoor World Cup Soccer Tournament, Donald S. Spencer Student Recreation Center. The five-on-five games will follow intramural indoor soccer rules. Registration, due by Nov. 7, can be completed at imleagues.com/wiu. • Wednesday, Nov. 15, 3-4 p.m. – French Conversation Hour, Morgan Hall 303: All levels of French speakers welcome. • Monday, Nov. 27, 6-8 p.m. – "Allegro Non Troppo" film screening, Simpkins Hall 220: The film is a parody of Walt Disney's "Fantasia." Food and drinks will be provided. • Tuesday, Nov. 28, 7 p.m. – "He Named Me Malala," documentary screening, University Union Sandburg Theater: The documentary follows Malala as she advocates for the rights of women and girls' access to education. A discussion will follow the screening. For a complete listing of events, visit wiu.edu/iew. For more information, call (309) 298-1150 or email CIS-Activities@wiu.edu.